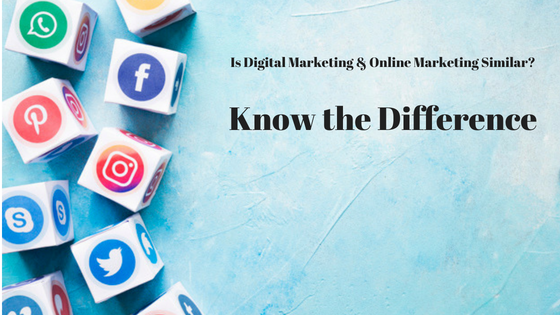 These two terms, Digital Marketing and Online Marketing are often found confusing. Many people claim them to be the same. But are they really? Let’s find out. To know the overall strategy of marketing, the difference between the two terms will help you a lot. You can categorize different types of marketing efforts and plan your strategy accordingly. Now, check out what these two terms actually mean. The online marketing can be called a subset of the digital marketing. Most of the components, which are used in the digital marketing fall under the boundary of online marketing. Now, we will find out what is the relationship of the digital marketing with various online marketing channels. Website: Different types of websites are there like the corporate website or personal website. There are personal blogs too which are hosted using a shared platform like Tumblr or WordPress. Many campaigns use a website as a starting point. For promoting a website for getting more traffic, digital marketing campaigns are run. SEO: The approach which is used mostly is the PPC (Pay Per Click) and the tool most widely used is the Google Adwords. You can advertise using it on Google and other partner networks. Social Media Marketing: This is one of the many components of online marketing which is generating immense popularity with time. You can now find millions of users all around the globe spending times on Twitter, Facebook, Instagram, Google+, Youtube, Pinterest, LinkedIn, and many other platforms like that. Now, digital marketers know this fact pretty well and hence they included Social Media Marketing as an important part of their campaign. Email Marketing: To convert the reader into an efficient customer, email is still the most important tool which is used in the digital marketing process. Other than this, there are some more channels which are part of both digital marketing and online marketing like Content Marketing, Mobile Marketing, Banner Advertising, etc. One thing we all must keep in mind that the Online marketing and the Digital Marketing are interconnected. Whenever we discuss about the digital marketing, we are always talking about the channels of online marketing along with SMS and WebTV. So if you have any requirements related to Digital Marketing or Online Marketing, We at ValueDigital a Digital Marketing Consulting Agency in Navi Mumbai will be happy to assist you. Connect with us @ info@valuedigital.co.in.